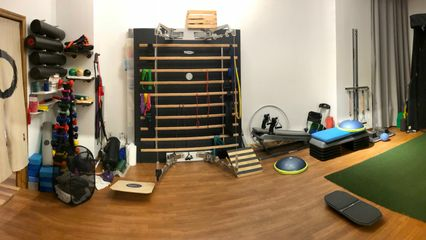 BetterPT - FuncPhysio - Midtown Manhattan -- FuncPhysio Physical Therapy P.C. Yohei Takada is originally from Japan and he has been extensively trained in manual/orthopedic/sports physical therapy. After graduating from a Doctor of Physical Therapy (DPT) at Columbia University in the city of New York, he completed two-year process of Advanced Orthopedic Physical Therapy residency program at Touro College and received Certification in Advanced Orthopedic Physical Therapy (CAOPT). He passed a Certified Functional Manual Therapist ™ (CFMT) with distinction through The Institute of Physical Art in 2013. Dr. Takada is a board certified Orthopaedic Clinical Specialist (OCS) and a board certified Sports Clinical Specialist (SCS). He is also a certified full body Active Release Technique (ART) provider, certified golf fitness instructor (level III Medical Profession, level II junior coach) by Titleist Performance Institute, a Certified Strength and Conditioning Specialist from The National Strength and Conditioning Association (NSCA), a certified Functional Movement Screen provider (FMS), a certified Selective Functional Movement Assessment provider (SFMA), as well as a certified Graston technique provider. Emi is a New York-Licensed Doctor of Physical Therapy. She earned her Bachelor of Science in Kinesiology and Exercise Science at Michigan State University and her Doctorate in Physical Therapy at Long Island University. Emi has experiences in variety of clinical settings including inpatient hospitals, neurological rehabilitation and orthopedics. She is currently pursuing a residency program through the Institute of Physical Art to become certified in Functional Manual Therapy (FMT). She continues to improve her clinical reasoning and manual skills by taking continuing education courses. Outside of the clinic she enjoys staying active by running and playing sports such as basketball, soccer and volleyball which she played competitively in college. She is fluent in English and Japanese. Dr. Fujii graduated from California State University of Fresno (CSUF) with Master of Physical Therapy (MPT) in 2008. He started working part-time in an outpatient orthopedic clinic and completed his Doctorate of Physical Therapy (DPT) in 2009 through a joint DPT program at CSUF and University of California San Francisco (UCSF). Dr. Fujii earned his Certification in Functional Manual Therapy (CFMT) with honors from Institute of Physical Art (IPA) in 2013. Dr.Fujii is one of the 3 therapists along with Brent Yamashita and Taiji Matsumoto, who helped establish IPA Japan in 2010. He goes to Japan couple of times a year for courses and assists in teaching as well as for interpretation. He spent 1 year working in New Delhi, India from 2015-2016 at an IPA partnered clinic, Vardan. While in India, he treated complex patients and provided training and mentoring for the Indian physical therapists. He pursued his learning for a year long Fellowship Program through the IPA in Steamboat the past year. He will be acknowledged as a Fellow of the American Academy of Orthopedic Manual Physical Therapy (FAAOMPT) in 2018. Spencer focuses on helping patients enjoy life to the fullest by helping them remain active and functional into their golden years, avoid unnecessary surgeries and painful injections, and spend more time enjoying the activities they love such as spending time with loved ones and traveling. Spencer has been a Certified Strength and Conditioning Specialist (CSCS) since 2015. He has also held a certificate in Plant-Based Nutrition through the T. Colin Campbell Center for Nutrition Studies at Cornell University since 2014. In 2018, Spencer completed a 9-month residency in advanced proprioceptive neuromuscular facilitation (PNF) at Kaiser Permanente Vallejo Medical Center, working primarily with post-stroke patients. PNF is a form of hands-on resistive therapy that specifically stimulates the action of certain muscle groups in conjunction with the core to help improve ease of movement.